Many years have passed since Wrack crawled out of his ancient mossy grave. Only now do the painful shards of his shattered memories begin to return, and with them he is left with only more questions. Brin, still consumed with desire to avenge her father’s death, feels compelled to seek answers in the ancient city of Flay, a city that is ruled by the most powerful of all The Doomed: The King. In a city filled with tyranny, secrets, and ancient horrors, can Wrack find the strength he needs to drive back the shadow of doubt that lingers over his soul? Or when faced with these nightmares, will he finally succumb to the monster that lingers beneath his skin? 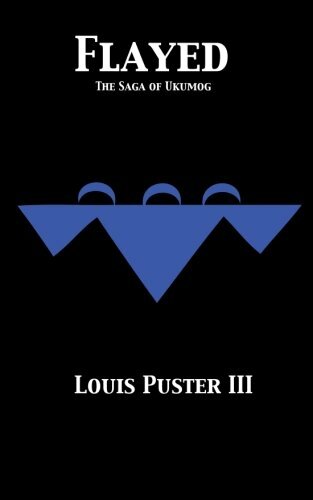 “Flayed is an epic fantasy novel by author Louis Puster III and the third volume in the continuing Saga of Ukumog. The action continues to center around our unlikely hero, Wrack, who has had much to discover about his dark heritage since crawling out of his own grave. After the brief flashbacks that have haunted him for some time, now his real memories begin to bleed into his mind and leave him with yet more to discover. His hearty companion, the beautiful warrior Brin, has her own demons to slay, perhaps even literally as she embarks upon a journey to Flay in search of answers as to the death of her father. But here there are dark temptations beyond all measure, those that may turn Wrack into a monster for good.